Amy Winehouse is desperate to stay sober for her new boyfriend. The troubled 'Rehab' singer was reportedly admitted to The London Clinic - where she has been treated before for alcohol-related problems - on Friday (11.06.10) after director Reg Traviss told her how much he hates her hard=partying ways. A source told The Sun newspaper: "When she's not on the bottle they get on brilliantly. But Reg has told her to quit the drinking, otherwise he'll be off, and she hit it hard last week. She wants to keep him so has decided to make a huge effort to stay sober." Amy has been dating the filmmaker since they met at his parents' pub in central London a few weeks ago, and the pair have made many promises to one another as their romance becomes more serious. Earlier this month Reg dumped his other lover of two years, burlesque dancer Raven Isis Holt, and Amy ended her reconciled relationship with ex-husband Blake Fielder-Civil. The 'Rehab' singer has battled drug addiction and alcohol problems in the past, and was hospitalised in 2007 for a reported overdose of heroin, ecstasy, cocaine, ketamine and alcohol. Last year, Amy took part in a drug replacement programme.Her parents Mitch and Janis are delighted about her new romance, and are thrilled she has finally broken off from her former spouse Blake - who they have previously blamed for her addictions. 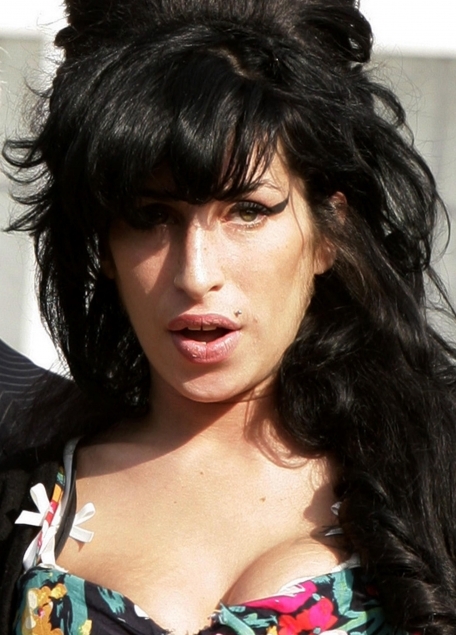 Janis added: "Amy, bless her, is a little girl in love. I think it's what's called early days, but it's great for me to see Reg making her so happy. She seems to like everything about him. Amy knows that she and Blake are no good together but she says they will always be friends. They have been through so much together." Her latest trip to the hospital is believed to be her fifth visit to a medical centre in recent months.